After being on a plane and jet setting somewhere for hours, the first thing I want to do is take a shower. But, it can be a long time until that happens in some circumstances (by the time you get off the plane, get your luggage and take a cab to your hotel), so I always like to refreshen by brushing my teeth (or at least chewing gum), putting on a little deodorant and some sweet smelling (not overpowering) perfume. Well, this is the one I'll be taking with me on my next trip. 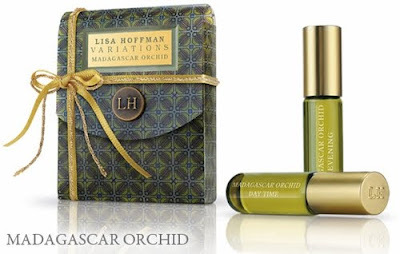 It's Madagascar Orchid oil perfume, by Lisa Hoffman. The perfume rubs on and comes in a small bottle that's easy to carry along with you when you travel. It's a floral fragrance with hints of jasmine. Two bottles come in the case (one for day time and one for evening) and the price is $43. It's a limited edition set, so make sure to buy one fast before they run out. My friend, Erika, just got married this past weekend and this is what she wore for her wedding- so if it was good enough for that, then you know this stuff is great enough to wear on vacation too! Lisa Hoffman has other great skincare and perfume products on her website that you may love as well, so make sure to check her stuff out.